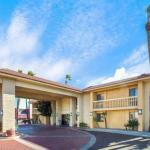 The free breakfast and complimentary Wi-Fi are two often-cited favorites at the non-smoking La Quinta Inn Tucson East situated minutes from everything that brings you to Tucson. The two-story La Quinta offers 140 non-smoking rooms with free Wi-Fi cable TV AM/FM alarm clock radio hairdryer iron and ironing board. Larger rooms feature microwaves fridges and outdoor seating areas. A complimentary breakfast served every morning including make-your-own waffles. The hotel has an outdoor pool with a hot tub in a shaded patio just the thing after a day in the Southwestern sunshine. Other on-site amenities include a guest laundry photocopy center and conference/meeting space. Pets are welcome for a fee. Parking is on the house.La Quinta Inn is east of downtown Tucson just a 10-minute drive from Davis Monthan Air Force Base. The base is home to one of the world's largest collections of aircraft housed in the Pima Air and Space Museum. There are a number of restaurants in the immediate surroundings of the hotel and dozens more within a five-minute drive. The Park Place Mall is a five-minute walk from the hotel. Downtown and the Tucson Convention Center are seven miles away and Tucson International Airport is 11 miles away.